Todd Charbonneau and Matt MalloyCraft beer is on its way to Dorchester – mixed, fermented, and chilled; bottled, canned, and kegged; packaged, shipped, and tasted on site – all by the Dorchester Brewing Company, which expects to open its doors and show off its reclaimed wooden bars next spring at 1246 Massachusetts Ave.
At its base in the old M A Peacard Co.’s sheet metal contractor building, the company’s 25,000-foot space will house a contract brewing facility, the first of its kind in Boston. 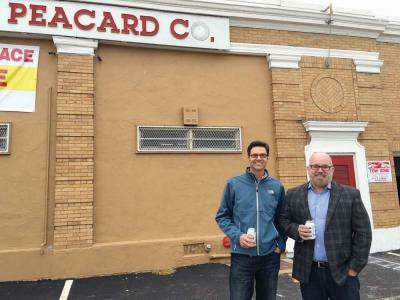 On Tuesday, company co-founders Todd Charbonneau and Matt Malloy, who started the company in 2014 with Travis Lee and Holly Irgens, conducted a tour of the gutted Peacard warehouse as they outlined the plans for their start-up style brewery in the newly acquired industrial space. “Our goal here is to collaborate with the brewers,” Malloy said. The approach is comparable to those at Uber, Airbnb, or Zipcar, where Malloy was vice president of marketing and operations. They will partner with varying sizes of craft brewer companies to handle every step from production to beer-in-hand. Charbonneau brings the expertise on the brewing side. The head brewer at Harpoon Brewery for ten years, he started the Banner Beer Company in 2012, which will be one of the first to occupy space in the new facility. Charbonneau estimates that there are about 60 to 100 small beer companies without designated breweries in Massachusetts, but, he said, Dorchester Brewing will not be limiting its scope to Massachusetts. Interstate and international groups have reached out, he said, as they look for ways to bring their independent beers to a Boston market. The company initially hoped to locate in the Bowdoin/Geneva neighborhood, Malloy said, but an arrangement with the CDC of Boston fell through. Trying to keep the company in its namesake neighborhood, the team looked at five other sites before landing on Mass. Ave. in July. And its headquarters represents a significant financial stake in the neighborhood. Including city and state slow loans, the company has raised over $2 million, according to Irgens. The city assessor’s website values the parcel at $1,150,000, which Dorchester Brewing purchased for $3.3 million funded through loans, Irgens said. It will be filled with $1.5 million of brewing equipment. Where now there are bare floors, cracked windows, and a massive abandoned safe will soon be two tasting rooms and a state-of-the-art brewing facility. Visitors will be able to take tours of the brewery floor or watch the process of beer production as they drink. Come spring, the company will be utilizing most of the building space. Room to expand is being set aside, with an eye toward doubling its 500-1000 barrel fermentation capacity over the next two or three years.